The Red Eye Tetra, a long-time aquarium favorite, is bred in captivity by the thousands! The Red Eye Tetra Moenkhausia sanctaefilomenae is one of the most readily available tetras. This aquarium fish is now bred extensively in Asia for the hobby. A school of these characins makes for an interesting and lively aquarium. Although this characin is not as flashy as many tetras, it has a charm all its own. Its most immediately noticeable features is the bright red spot over its eyes. Its body has a silvery golden sheen with a yellow band at the base of the tail fin, just in front of an even broader black band. The common name 'Red-Eye Tetra' describes the bright red spot on the upper part of its eye, which contrasts dramatically with its silvery body. Because of this, it is also called the Lamp Eye Tetra. Other common names refer to the coloration of this fish, such as Yellow-banded Moenkhausia and Yellowhead Tetra. These little tetras are very durable and will be found in tanks belonging to beginners as well as to more advanced fish keepers. They are very undemanding fish, quite hardy and easy to breed. These very active swimmers are also peaceful towards other fish, which makes them a wonderful addition to a community aquarium. They will be happiest if kept in a school of 5 or more of their own kind. A school will need an aquarium that is at least 15 gallons or larger with plenty of open space for swimming. They prefer a dark gravel and some plant cover. Even though these active fish have a good appetite, they will not touch the plants. The Red Eye Tetra Moenkhausia sanctaefilomenae was described by Steindachner in 1907. They are found in South America in Paraguay, eastern Bolivia, eastern Peru, and western Brazil. This species is not listed on the IUCN Red List. Other common names they are known by include Lamp Eye Tetra, Yellow-banded Moenkhausia, Red Eyed Tetra, Redeye Tetra, Yellow Back Moenkhausia, Yellowhead Tetra, and Yellowhead Characin. In the wild, they inhabit clear rivers but can sometimes be found living in the thick vegetation of the murky Amazon. They swim in schools and feed on worms, crustaceans, and insects. Aquarium specimens are now bred extensively in Asia. 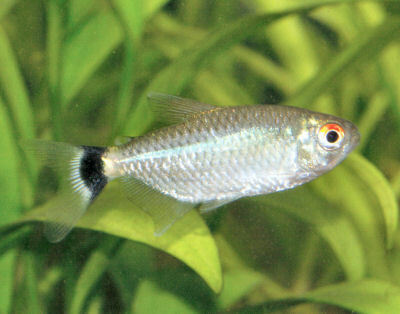 The Red Eye Tetra has a full-bodied, typical tetra shape. This fish will reach about 2 3/4 inches (7 cm) in length and has a lifespan of about 3 to 5 years in the aquarium. Its silvery body has a golden cast and transparent fins. One of its most distinguishing characteristics is the yellow band on the base of the caudal fin, just in front of a black area. Because of this band, it is commonly known as the Yellow-banded Moenkhausia. Another common name, Red-eyed Tetra, describes the bright red spot on the upper part of its eye. The hardy Red Eye Tetra is a good choice for the beginning fish keeper. Because of the great changes in water conditions between wet and dry seasons in its natural habitat, this fish is not fussy about water conditions and can tolerate a wide range, within reason. Since they are omnivorous, the Red Eye Tetra will generally eat all kinds of live, fresh, and flake foods. To keep a good balance, give them a high quality flake food every day. Feed brine shrimp (either live or frozen) or blood worms as a treat. Vegetables should be offered regularly to bring out the best of its color and appearance. Spinach is a great choice for this fish. This tetra prefers to eat multiple times a day. Offer only what they can consume in 3 minutes or less with multiple feedings per day. The Red Eye Tetra is easy to care for provided the water is kept clean. Aquariums are closed systems, and regardless of size, all need some maintenance. Over time, decomposing organic matter, nitrates, and phosphate build up and water hardness increases due to evaporation. To combat these ever-changing conditions, water should be replaced on a regular basis, especially if the tank is densely stocked. At least 25 to 50% of the tank water should be replaced every other week. These fish are fairly hardy, and a school of 5 to 6 will do best in a 15-gallon aquarium or larger. These fish do not prefer fast moving currents, so make sure to angle the filters to avoid disturbing them. In nature, these fish come from regions with dense forests that let little light through, so keep their tank dimly lit. The aquarium should be heavily planted around the sides and back and have plenty of open water for swimming in the front. A few hiding places would be appreciated. Woodwork and floating plants will make them feel comfortable. Add aquarium-safe peat to the filter to simulate the black water conditions they prefer. Also, adding a couple handfuls of dry leaves will also give these fish a natural feeling. It is best to use a river sand for the substrate. Minimum Tank Size: 15 gal (57 L) - This fish appreciates a large, open swimming area. Breeding Temperature: 80.0° F - These fish will spawn at 80 to 84° F (26.6 - 29° C). Red Eye Tetras are generally good community fish but will be happiest if kept in a school of 5 or more of their own kind. This tetra can intimidate sedate fish because they can be very boisterous, so keep them with other active tankmates. Good tankmates are other tetras, rainbowfish, barbs, larger rasboras, and danios. Most peaceful bottom dwellers will also make good tankmates. These tetras are known for their fin nipping, but keeping them in a school will discourage this. Same species - conspecifics: Yes - This fish should be kept in a small school of at least 5 of its own kind, though more are better. Plants: Monitor - Keep them well fed as they may snack on soft plant matter and new shoots it they get hungry. The only truly distinguishing feature to differentiate the sexes is the more rounded stomach of a mature female. Red Eye Tetras are egg layers and easy to breed. They will freely spawn in schools or in pairs, with each female scattering several hundred eggs. When they spawn they lock fins, and then while clasped, they perform a type of roll-over process in the vegetation. The female releases about a dozen eggs at time, and the male fertilizes them. Because of this spawning behavior, the Red Eye Tetra is one tetra that must not have too dense a spawning vegetation. A separate breeding tank will help to get the best number of fry. A 20-gallon spawning tank is fine, with a temperature of 80 to 84° F (26.6 - 29° C). Keep the tank dimly lit with clumps of spawning mops or java moss, so the female has a place to deposit the eggs. A layer of mesh also works as long as the spaces are wide enough for the eggs to pass through and small enough to keep the parents out. The water should be soft and slightly acidic with a pH 5.5 - 6.5 and a hardness of 4° dGH or less. A small, air-powered sponge filter is needed for filtration and will provide a gentle water flow. Filtering the water through aquarium-safe peat is a good choice. They can be spawned in pairs, but for best success, spawn them in groups of about 12 individuals, with half a dozen each of males and females. Prior to breeding, condition the males and females in separate tanks. Feed them plenty of small live foods for about 7 to 10 days. Select a breeding pair or small group and transfer them into the breeding tank in the evening. They should spawn the following morning. A mature female's belly will become nicely rounded when she is full of eggs. Choose males that are the most colorful. Once a successful spawn has been achieved, remove the parents, or they will eat the eggs. The eggs will hatch within 24 to 36 hours, and fry become free-swimming 3 to 4 days later. For the first few days, feed the fry infusoria-type foods until they can feed on microworm or brine shrimp nauplii. See Breeding Freshwater Fish: Characins for a general description of breeding processes, and see Fish Food for Fry for information about types of foods for raising the young. The Red Eye Tetra is very hardy, and disease is not usually a problem in a well-maintained aquarium. That being said, there is no guarantee that you won't have to deal with health problems or disease. Anything you add to your tank can introduce disease. Not only other fish but plants, substrate, and decorations can harbor bacteria. Take great care and make sure to properly clean or quarantine anything that you add to an established tank so as not to upset the balance. A good thing about the Red Eye Tetra is that due to their resilience, an outbreak of disease can often be limited to just one or a few fishes if dealt with at an early stage. When keeping more sensitive types of fish, it is common for all fishes to be infected even before the first warning signs can be noticed. The best way to proactively prevent disease is to give your Red Eye Tetra the proper environment and a well-balanced diet. The more closely their environment resembles their natural habitat, the less stress the fish will have, making them healthier and happier. Stressed fish are more likely to acquire disease. As with most fish, they are prone to skin flukes, parasitic infestations (protozoa, worms, etc. ), ichthyobodo infection, parasitic infestations (protozoa, worms, etc. ), bacterial infections (general), and bacterial disease. Aquarists should read up on common tank diseases. Knowing the signs and catching and treating them early makes a huge difference. For information about freshwater fish diseases and illnesses, see Aquarium Fish Diseases and Treatments. 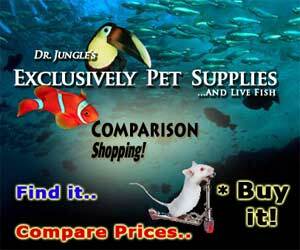 The Red Eye Tetra is readily available in pet stores and online and is moderately priced. i have a 55 gallon tank with a 12 inch albino pleco a 6 inch female convict and 2 two inch red eyed tetras. My tank is about 3 yrs old. Last week i added 2 two inch yellow peacock cichlids. These fish are not really supposed to be compatible. My fish are all rescues as i live out in alaska its hard to buy fish here. Anyway, my tetras took to the peacock cichlids they school together beautifully. They all swim loops around my convict. My tetras are mean little fin nippers, very aggressive. Why do they reccomend them for docile aquariums? I know the OP won't see this as he posted long ago, but for readers who see it, the reason the red eye tetras are "mean little fin nippers" is because they are insecure because the OP only had two and they are schooling fish. They need to be in groups of 6 or more of their own species. And they won't be safe with cichlids. Cichlids are not community fish. I would have suggested he set up a second small tank for the red eyes and put the two of them in their alone, if he can't get more of them. They won't feel as threatened if they are the only fish in the tank. I bought 3 good sized Lamp Eyed Tetras about a year ago and intoduced them tk their own tank after cycling. I also had 2 Pea Puffers that I rescued from some shady store (they fared a much better life in my tank) which eventually passed from age. After they passed, my tetras bred on their own and I woke up to 8 new tiny tetras! I only have a 20 gallon long tank.... is this ok? or should I try to sell a few? I can't believe they just bred on their own without me introducing a breading tank! Hello, Friday i got 6 red cardinal's, yesterday i could only count 5, and today 4! I have just witness the red eye tetra's chase and eat 1, is this normal behavior? Well tetra's can get nippy, and bigger fish often go after smaller fish. You usually want to have each type of tetra in a good sized school, and have plenty of hiding places with plants and decor. Just added three red eye tetras to my 20 gallon long tank. Long time occupants are three Julii corys, two peppered corys, one large emerald cory and two otocinclus. Also adopted a tiny Julii when I got the tetras because it was in a tank with only two female guppies that wouldn't play like corys. They have all adapted well to a well established tank with very active moving water. Would like to add two more tetras, because they really like to be in a group of five or more, but don't want to overpopulate the tank. So far there is no problem keeping water clean and clear. Using CaribSea Eco-Complete substrate, which is phenomenal for the corys. Always use an oversized filter along with a sponge filter and extra air stone. Some live and some plastic plants. Appreciate opinions on adding the additional two tetras.